The root or rhizome of perennial herbaceous plant Rheum palmatum L., or R. tanguticum Maxim. ex. Balf. or R. officinale Baill of family Rhubarb. Rheum Palmatum L. and R. tanguticum Marim. Ex. Balf. are called as Bei Da Huang which grows in Qinghai and Gansu provinces of China, while R. officinale Baill is known as Nan Da Huang, produced mainly in Sichuan province of China. Collected at the end of autumn or the following spring. Fragrant smell, bitter and light astringent taste. Yellowish-brown, asterion obviously, heavy with hard texture, oily. Cut into cubes and dried, stir-baked or steamed with alcohol, carbonized or processed. Bitter, cold; large intestine, spleen, stomach, liver and heart meridians entered. Remove accumulation with purgative, clear heat and purge fire, cool blood and stop bleeding, remove toxicity, activate blood and dispel stasis, clear heat and resolve dampness. Being bitter and cold with actions of unblocking and descending, it can remove accumulation with purgative. So it is an essential herb for treating constipation due to accumulation, especially heat accumulation accompanied with high fever, restless and abdominal distention. It is often combined with bowel-relaxing purgatives and qi-moving and distention-relieving herbs, for example, Mang Xiao, Hou Po and Zhi Shi in the formula Da Cheng Qi Tang from Shang Han Lun. It is indicated for various kinds of constipation through compatibility. For constipation due to cold accumulation, it should be combined with interior-warming herbs, such as Fu Zi and Gan Jiang in Wen Pi Tang from Qian Jin Fang. For constipation due to heat accumulation accompanied with deficiency of qi and blood, it is combined with qi-replenishing and blood-nourishing herbs, such as Ren Shen and Dang Gui, as in Huang Long Tang from Shang Han Liu Shu (Six Books of Cold-Induced Disease). For dry stool obstruction due to heat accumulation and body fluid consumption, it is combined with yin-nourishing and fluid-producing herbs, such as Mai Dong, Sheng Di and Xuan Shen in Zeng Ye Cheng Qi Tang from Wen Bing Tiao Bian. With action of relaxing bowels with purgative, it can remove accumulation in stomach and intestines. For food stagnation, it is combined with digestants. For initial dysentery due to damp-heat, it is combined with heat-clearing and dampness-drying herbs. For intestinal parasites, it is combined with vermifugals. Being bitter, cold, descending and purging with action of conducting heat downwards, it can clear heat, purge fire, cool blood and stop bleeding. For blood-shot eyes, headache, sore throat and pain and swollen gum due to up-flaming of zang-fu fire-heat, it is often combined with heat-clearing, fire-purging, toxicity-removing and swelling-relieving herbs, such as Huang Qin and Zhi Zi in Liang Ge San from Tai Ping Hui Min He Ji Ju Fang. For hematemesis, epistaxis and hemoptysis due to fire-heat forcing blood to circulate irregularly, it is combined with heat-clearing herbs and bleeding-stopping herbs, for example, Zhi Zi, Ce Bai Ye and so on in Shi Hui San recorded in Shi Yao Shen Shu (Miraculous Book of Ten Recipes). It can clear heat, remove toxicity, cool blood, activate blood, as well as purge heat-toxin downwards, so it is indicated for both internal and external sores and abscess with swelling pain. For abscess, deep-rooted boils and furuncles, it is often combined with toxicity-removing and abscess-curing herbs, such as Jin Yin Hua, Pu Gong Ying and Lian Qiao, etc. For intestinal abscess with abdominal pain, it is often combined with herbs of cooling blood and curing abscess and herbs of activating blood and relieving pain, for example, Mu Dan Pi, Tao Ren and so on in Da Huang Mu Dan Tang recorded in Jin Kui Yao Lue. For burn due to hot liquid or fire, it can be used singly or in combination with Di Yu after being ground into powder, mixed with sesame oil and then applied on the affected area. With actions of activating blood and resolving stasis, it can both drive stasis downwards and clear stasis-heat. So it is indicated for many kinds of diseases caused by stasis. It is often combined with blood-activating and stasis-resolving herbs, such as Tao Ren, Hong Hua and Tu Bie Chong, etc., here are some examples: Xia Yu Xue Tang from Jin Kui Yao Lue is mainly indicated for abdominal pain due to stasis after parturition; Da Huang Zhe Chong Wan from Jin Kui Yao Lue is mainly indicated for abdominal stasis mass; Tao He Cheng Qi Tang from Shang Han Lun is mainly indicated for amenorrhea and dysmenorrhea due to stasis; Fu Yuan Huo Xue Tang from Yi Xue Fa Ming is mainly indicated for traumatic injury, stasis pain in chest and hypochondrium. It excels at clearing hear and resolving dampness, and is indicated for syndrome of damp-heat accumulation. For jaundice due to damp-heat, it is often combined with heat-clearing, damp-excreting anti-icteric herbs, such as Yin Chen Hao and Zhi Zi in Yin Chen Hao Tang from Shang Han Lun. For stranguria due to damp-heat, it is often combined with heat-clearing, stranguria-relieving diuretic herbs, such as Mu Tong and Che Qian Zi in Ba Zheng San from Tai Ping Hui Min He Ji Ju Fang. Decoct 10～15 g. Proper dosage is for topical administration. The fresh Da Huang is stronger in purgation than the prepared. Therefore, the unprocessed is suitable for offensive purgation. Because over-decocting will weaken its purgation action, it should be decocted later or infused with boiled water. The one stir-baked with alcohol is weak in purgation, but good at resolving stasis, which is suitable for stagnant blood syndrome or fire-heat in upper body. The carbonized is suitable for syndrome of bleeding. 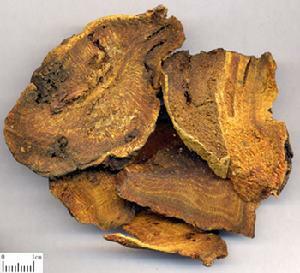 It should be used with caution in case of spleen and stomach deficiency for its bitter and cold property which is easily to damage stomach qi. It is contraindicated to women during pregnancy, menstruation or lactation for it has actions of activating blood and resolving stasis, and can make the purged substances follow lactating out.